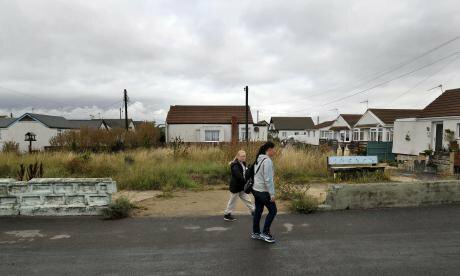 Image: Clacton, Essex. Credit: Nick Ansell/PA Images, all rights reserved. Poverty stalks the land with more than 4.5 million children living below the breadline, over half of them being trapped there for years. It is hardly surprising that those in hardship are more likely to have poor health, bombarded with pressures to eat cheap fast food, unable to afford to meet government healthy eating recommendations and without time or healthy environments to take exercise in. Shamefully poverty is especially prevalent in families with a child with a disability. Just imagine what it is like trying to provide for healthy food, sport and exercise in a family with a disabled child requiring 24-hour care seven days a week. Take the plight of mother Jo Cousins who is facing the loss of vital support for her disabled son Seth as a result of Northamptonshire’s dire finances closing the centre for respite care. The difficulties these families face is exacerbated by the “pointlessly cruel” benefit sanctions identified by MPs to be arbitrary and punitive. The debacle over changes to Universal Credit expose a ‘group think’ political mindset out of touch with real people and their lives alongside a stark lack of compassion for the most vulnerable. The heart-rending report of a 9-year old child begging a charity for any work going to pay for food since her mum had died and her dad had lost his job is a devastating indictment of the effects of this political attitude driven by the Treasury. The number of homeless children and those needing protection is soaring, with many authorities failing to intervene until complex cases reach crisis point; around two thirds of all looked after children (around 47,000) are under the care of councils that, say Ofsted, are inadequate or require improvement. Eight years of savage austerity have devastated children’s services so that we now have some of the worst outcomes for children across health, social care, education, youth justice and poverty in the developed world. The health of children overall is dismal including soaring rates of emotional and mental ill health – despite the fact that the challenges have been well known for at least 20 years. Over 150 children every day are being turned away from CAMHS (child and adolescent mental health services) with some children being advised by GPs to exaggerate their symptoms to get access to treatment. Over one third of children are obese, we have one of the lowest rates of breastfeeding in Europe, poor control of diabetes, and inadequate transition to adult services for children with physical and learning disabilities. It all points to massive challenges for families and children created by government policies. But it is not only in health and social care where there are shocking examples of disastrous political policy, indifference to the best interests of children, and an ideological fixation on making ‘choices’ which are, to many, an impossible dream. Thus, outstanding schools teach a minority of children where parents can pay for independent education or live in the catchment of an excellent state school; but there are countless other children whose parents can’t. Children whose schools are hit by a government-triggered exodus of experienced teachers. A government that has lowered the entrance requirements for teacher training, and has cut school funding so deeply that thousands of head teachers have taken to the streets to protest, that has imposed a narrow test-oriented curriculum driven by zealots teaching to the test. A government that dismisses the stress and even child exclusions caused by the perverse incentives of SATS league tables. It all points to an education system not fit for purpose today. Against this we have a minister being exposed to distort the statistics on spending for schools, deepening public distrust of politicians. Alongside poverty and inequality of hope there is the revolving door of young offenders returning to prison in a ‘system’ attuned to the Victorian ethos of punishment and control. An objective observer such as an alien from Mars would see here today a government that appears oblivious to the importance of children in society. Through an economic lens we need healthy, educated, creative, happy children equipped with the life skills for those who can to become confident adults and parents in due course. And those who can’t through disability or disadvantage must be supported to develop their full potential. Surely, this should drive political policy, but it doesn’t. My new book “The British Betrayal of Childhood” highlights the need for a “paradigm shift” in our public and political attitude to children, modelling an approach from the very best countries for children such as Canada, Holland and Finland. Building local community responsibility for children is key. “It takes a village to raise a child”, as they say. In other words, the ‘nurture’ of children should be everybody’s business – parents and families, schools, faiths, businesses, voluntary and statutory services – all driven by the best interests of children in policies and practices that address their needs. The Human Early Learning Partnership model in Canada describes the local context through ‘mapping’ children’s lives from routine data. The concept is simple – to ‘map’ by postcode locality data on children’s lives – inputs, outputs and outcomes across health, education, social care, youth justice and poverty. These data are used by childhood coalitions, schools, government ministries and researchers to inform advocacy for children’s needs, and to recommend changes to policies and funding. There is incontrovertible evidence that we really are betraying our children on a grand scale in Britain today. Rather than exhorting the poor, the young and the marginalised to exercise ‘choices’ they simply don’t have, I call on politicians of all parties to listen to the reality of child and family life, understand the enormity of what has to be done and produce a coherent long term cross-party political agreement on what we should be trying to achieve for our children. This can then be the basis for consensual, common sense policies to improve outcomes. Politicians have responsibilities for children too! 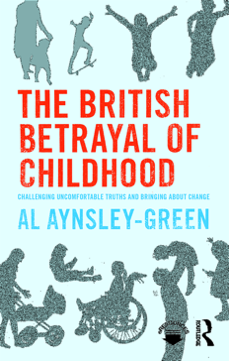 Sir Al Aynsley-Green’s book ‘The British Betrayal of Childhood’ is published now by Routledge.